Buy New Sony NEX-6L (SEL1650) (White) Malaysia At FotoZZoom! Experience the Alpha SLT-A37, Sony's newest addition to their Alpha DSLR series. As the successor to the SLT-A35, the new SLT-A37 includes advanced features such as translucent mirror technology, a 16.1 resolution and BIONZ processor. Capture your moments precisely with Tele-zoom High Speed Shooting at up to 7 frames per second, complete with continuous auto focus. While conventional DSLRs can only shoot or focus with the speed and precision of Phase Detection AF separately, the SLTA37 utilizes Translucent Mirror Technology that directs light to both the image sensor and the Phase Detection AF sensor simultaneously. Enjoy incredible detail and gorgeous enlargements with the SLT-A37. Featuring APSC sensor size and Sony Exmor APS HD CMOS technology, the camera achieves high resolution with no penalty in lowlight sensitivity or sensor noise. Conventional image sensors use only a handful of analog-to-digital (A/D) converters, which can slow you down. The Exmor sensor provides more than 4,000 column-parallel A/D converters. This helps enable continuous shooting at up to 7 frames per second. With the SLT-A37, you can enjoy incredibly clear low?light pictures without sacrificing detail, made possible by the low?noise Exmor APS HD CMOS image sensor and refined BIONZ image processor. Image stabilization reduces blur by compensating for camera shake. With SteadyShot INSIDE, image stabilization is built into the camera body itself. You'll reduce blur with every a?mount lens, including macro and wideaperture standard zoom lenses. Typical DSLR systems build image stabilization into selected lenses only. The Translucent Mirror makes it easier to capture those precise moments, while the Tele Zoom High Speed shooting mode shoots up to 7 fps at 8.4 MP and maintains continuous auto focus and auto exposure. When most DSLRs shoot video, their Contrast AF is slow and visibly ?unts?for focus. The High Speed AF Full HD Movie retains the same fast, precise Phase Detection you enjoy for still images.1 It? a decisive advantage for tracking fast-moving subjects and a major benefit of Translucent Mirror Technology. With a BIONZ image processor, the chroma noise reduction delivers high-resolution, low-noise photos even at ISO 12800 sensitivity. Also enables up to 5.5 fps continuous shooting at full resolution, Sweep Panorama mode and more. Simply photograph a person and Auto Portrait Framing will save an additional, optimally framed image in portrait or landscape orientation. Combining Face Detection and By Pixel Super Resolution technologies with rule of thirds, Auto Portrait Framing provides beautifully composed and balanced full resolution portraits. Utilizing Sony? exclusive By Pixel Super Resolution Technology, Clear Image Zoom increases the effective focal length of your lens up to 2x by digitally magnifying the center of your image with nearly imperceptible degradation. It virtually doubles the effective focal length of whatever lens you?e using providing greater shooting flexibility. Get cleaner, more dynamic pictures and fewer missed shots. 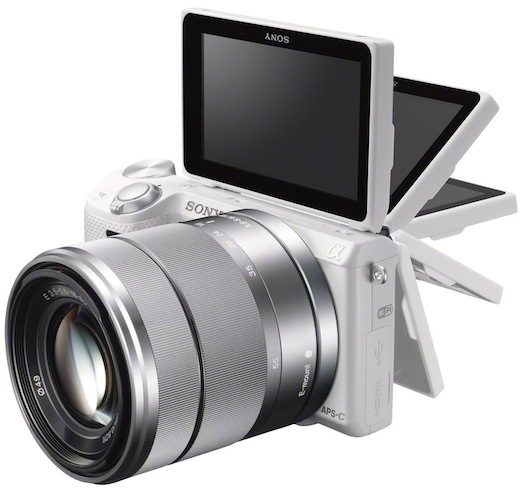 Unifies and simplifies Sony intelligent technologies, the SLT-A37 automatically recognizes the correct scene mode, then quickly shoots and combines up to six shots to produce images with greater clarity, optimum dynamic range using Auto HDR technology and lower image noise using 6 shots layering technology. The viewfinder displays your scene with clarity so you can fine tune every aspect of your image with confidence and achieve desired results. Its highend specifications include a notably wide 36.2 degree viewing angle and sharp 1440kdot resolution and provides 100% frame coverage. Exposure preview and informative overlays make operation easy. Control how the camera processes your images with six finishing styles: Standard, Vivid, B&W, Sunset, Portrait and Landscape. You can even fine-tune contrast, saturation, and sharpness to your personal taste. Get cleaner and sharper nighttime pictures?beyond the capability of traditional cameras?without using flash or a tripod. The camera captures six images in a fraction of a second. Combining the data with separate algorithms for still and moving parts of the picture reduces blur, minimizes noise and enables extraordinary detail. Capture vast scenic vistas and 16:9 shots in spectacular 3D. As you sweep across the panorama, the camera records separate right-eye and left-eye images that make landscapes come alive on your 3D television3. Records both JPEG and MPO file formats. Tilt it up or down to frame high- and low-angle shots that would otherwise be hit-or-miss. Tilt and swivel under the camera for self-portraits. Fold it flush to the camera with the LCD exposed for shooting or protected for travel. The camera can automatically detect up to eight individual faces and adjust focus, exposure, white balance and flash to help deliver crisp, properly lit images of family and friends. It can also prioritize children or adults. The a37 allows you to capture a smile the moment it happens. Simply select the Smile Shutter mode and the camera takes the picture automatically and you can adjust the smile sensitivity. Enjoy HD movies and stunning still images on a compatible HDTV9. The camera includes an HDMI output. In addition, the BRAVIA Sync system works with compatible Sony BRAVIA HDTVs enabling you to control camera playback using the television's remote4. Anti-Dust Technology helps keep the CMOS sensor clean, resulting in consistently clear pictures. A static-free coating on the sensor's low-pass filter helps repel dust and the vibration automatically dislodges dust from the sensor. To help you shoot more effectively, the built-in flash automatically pops up and fires as needed when the camera is set to certain scene selection modes. The built-in flash can also trigger a wireless accessory flash (sold separately). The integrated hot shoe enables you to expand your lighting options with a range of accessory flashes (sold separately). Take up to 500 shots on a single charge with Sony Stamina battery power.5 Sony's InfoLITHIUM battery system enables you to see the percent of power remaining, so you can keep shooting in confidence.